To ordinary people, science used to seem infallible. Scientists were heroes, selflessly pursuing knowledge for the common good. More recently, a series of scientific scandals, frauds and failures have led us to question science’s pre-eminence. 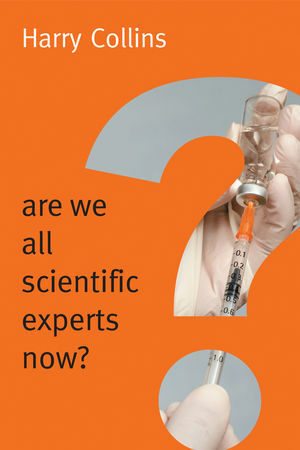 Revelations such as Climategate, or debates about the safety of the MMR vaccine, have dented our confidence in science. In this provocative new book Harry Collins seeks to redeem scientific expertise, and reasserts science’s special status. Despite the messy realities of day-to-day scientific endeavor, he emphasizes the superior moral qualities of science, dismissing the dubious “default” expertise displayed by many of those outside the scientific community. Science, he argues, should serve as an example to ordinary citizens of how to think and act, and not the other way round. Harry Collins is Distinguished Research Professor of Sociology and Director of the Centre for the Study of Knowledge, Expertise and Science (KES) at Cardiff University. He is a Fellow of the British Academy. He has written 17 previous books including the well-known Golem series on science. Harry Collins is continuing his research on the nature of scientific knowledge, on the analysis of expertise and on the sociology of gravitational wave detection. "To the extent we might come to witness a reaction against the fallen idol of everyone thinking they are an expert, Are We All Scientific Experts Now? might come to be a classic, a Gangnam Style shot across the STS bow." "In his remarkable manifesto, sociologist Harry Collins, a major voice in the field of science studies, answers the provocative question presented in the books title: Are We All Scientific Experts Now? Collins starts out by outlining sciences fall from grace in the publics eye and by presenting a tongue-in-cheek caricature of scientific expertise based on the zeitgeist he holds responsible for the distortions." "A valuable contribution to the ways in which we ascribe value to expertise ... Although Collins convincingly answers the books title question with a resounding no, what is most interesting and refreshing about his analysis is that it enables people holding different kinds of expertise to recognise their role in scientific debate." "Certainly a book for those who are interested in science and its role in society. For those who are curious about how scientists tackle problems and why they do often have the answers, it should prove illuminating." "This brave, thoughtful little book should be sent to every newspaper editor. Collins doesnt write with Ben Goldacres righteous anger, but his careful, nuanced scholarship is just as persuasive." "Brief book with a very high level argument relying a lot on his experience... this kind of nuanced, important thinking about science and expertise is a wonderful gift from Collins that I truly hope we don't squander." "[O]ne of the best examples of practical philosophy of science for regular people I have encountered."